Our integrated sales, manufacturing and warehousing organization allows us to work hand-in-hand with customers, engineers and distributors to develop quality products at a competitive price. The advanced technology and strict testing procedures implemented at our manufacturing facilities in the United States and overseas, allow us to develop high volume products, with uncompromising, superior quality. This is why Bonney Forge is the number one resource for the power, oil, gas, chemical, marine and construction industries throughout the world. Bonney Forge has a state of the art Forge Facility capable of manufacturing our entire line of Forged Steel Fitting, Olet and Forged Steel Valve Products. This 55,136 sq. ft facility houses a fully integrated Closed Die Manufacturing Shop as well as four Mechanical Presses and a variable strike force Die Forger. Modern billet cutting equipment and induction billet heaters are used to support these critical forging operations. The 12,000 sq. ft. expansion houses 2 new Mechanical Presses increasing our capacity and capability up to 4,000 tons of forge strike force. 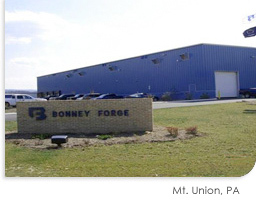 Bonney Forge has full-service machining and finishing operations that are contained in a 206,957 sq. ft. facility. This facility is continuously staying ahead of the competition by investing in leading technologies in applied processes. High volume machining equipment includes Multiple Spindle Trunnion Machining Centers, Large Capacity Rotary Dial Index Machines, and Multiple Spindle Bar Feed Turning Operations. Focus on quick change-over and tooling technologies helps keep Bonney Forge at the head of the pack. Normalizing Heat Treatment Equipment allows this fully integrated manufacturing facility to provide timely and efficient processing and accurate order delivery. Our Total Quality Management Programs support Bonney Forge's goal of The Best Value - Price, Quality, Service all the time. Bonney Forge has a 60,000 sq. ft. Warehouse/Valve Facility that sits on a 19 Acres "Green Field" site. This facility was planned and built with expansion capabilities in mind. Valve assembly and testing operations and equipment assures our Forged and Cast Steel Valves meet or exceed all applicable product specifications. 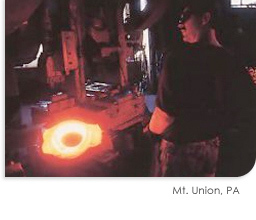 Bonney Forge performs "Value Added" operations at our Valve Operations that distinguishes us from the pack. WFI International is a fully integrated manufacturing facility that supplies commodity Branch Connections and specializes in Engineered to Order products. Our fully staffed and qualified Product Engineering Department and material processing and testing operations complement this self sufficient and modern manufacturing facility. WFI is also fully qualified and certified to supply your Nuclear Product needs. 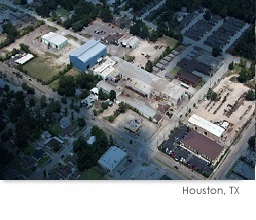 WFI currently operates in 101,500 sq. ft. of expanding facilities. Recently acquired property adjacent to our facilities will allow ample future growth capable of expanding our facilities to meet our Customer's needs. A recently completed 16,000 sq. ft. Forge Facility will house a brand new 3,000 Ton Hydraulic Open Die Press and enhanced Ring Roller to support the growing demand for complex Engineered Products. Continual investments in Machine Tools and other supporting equipment allow WFI International to stay in step with emerging stringent requirements. 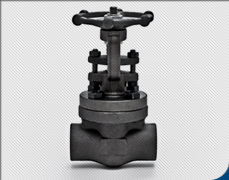 Bonney Forge Shanghai manufactures Cast Steel Valves from castings procured from our controlled and qualified foundries to the final quality products. Our new 10,000 square meter facilities performs all the required machining, assembly, testing and finishing operations required to supply a product deserving the Bonney Forge name. Continued attention and US Operations, Quality and Technical frequent visits oversight to casting quality, machine tool modernization, and processing operations support the growing demand for our quality products. 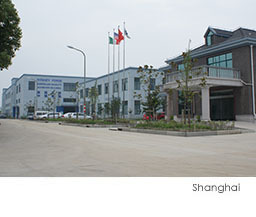 Bonney Forge Shanghai is a WFOE (Wholly Foreign Owned Enterprise) located in Shanghai, China. Bonney Forge Shanghai is wholly owned by Bonney Forge Corporation, a United States company. Wise investments have established BFE's domestic and international success. 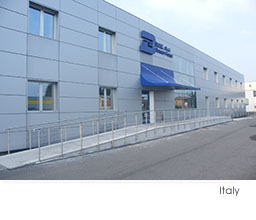 The Company has three production facilities with a total of 26,500 sq. meters and 69,500 sq. meters of Land. The main components for forged valves are forged and represent BFE's first basic factor of global quality, seeing that the entire manufacturing process is controlled and guaranteed by the Company Quality System. 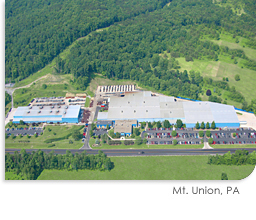 The management sales and operative offices are located here, as well as the machining, assembly and final testing workshop for forged valves, additional machining also available at the Castronno (VA) plant. The total synergism between the three production plants offers top of the market products. One can clearly see at BFE what distinguishes it as a model production facility - its constant technological up-dating. Forged pieces are in compliance with all prescriptions of international standards. The entire process is controlled by a Quality Control System according to UNI EN ISO 9001. BFE's Plants are certified in conformity with a WO/HPO/TRD 100/TRB 801 N°45 Markblatt by the leading German Institute TÜV and 97/23/EC pressure equipment directive.